With the wintery weather meaning that it’s dark when I leave for work and even darker when I get back home, it’s been a while since I’ve posted an outfit. And because I’ve just been dressing from work, I feel like I’ve fallen into a bit of rut: building myself a uniform of outfits that I already know work and that I can easily just throw on. Since I invested in my Beadnell just before Christmas, it’s hardly left my back and it’s definitely becoming a huge wardrobe staple. Barbour are one of those brands that I’ll always admire for not selling out and packing their HQ off to London. I think it’s brilliant for the region to have such an internationally renowned brand with its headquarters still based up here. Plus there’s something to be said for a proud North East based company that have stayed put and not only know their heritage but are proud of it. It seems a lot of British brands are following suit and embracing their roots from Mulberry to the creators of last year’s it-bag and star of a brilliant Google Chrome ad, The Cambridge Satchel Company. So being already something of a British brands fan girl now, I was over the moon when I was sent these navy Andalusia chelsea boots from Chatham Marine. When they first came, I wasn’t so sure about the chunky soles. They felt a little too conspicuous and bulky, but they’re definitely growing on me and with the recent bad weather, I realised they’d have been perfect for stomping around in the snow. Guess I’ll just have to keep my fingers crossed for more cold weather so I get more opportunities to break these babies in. Pairing them with black jeans and my Barbour, I realised that I’m developing a little affinity for heritage style. You have to appreciate the irony though of a girl who isn’t really the biggest fan of the great outdoors, having a new found love for country wear.. I guess if I do ever decide to take up rambling, at least I’ve be properly attired. 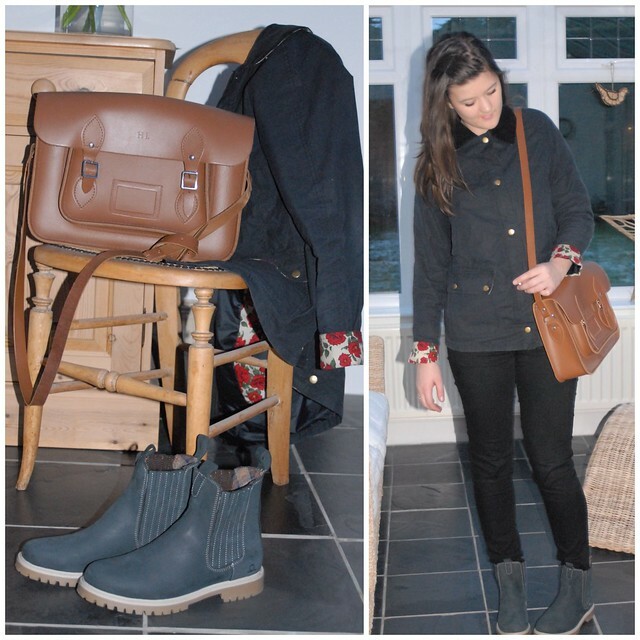 Next Post From Krispy Kreme with love..
Love that bag & those boots! They are gorgeous boots! And perfect for British weather!! I must say I have missed wrapping up and putting on big boots in the winter, it's been great to have warm weather for a change but you can't beat a good British chilly season! I'm rarely posting outfits either because of dark wheather – means I recreate the outfit on a Sunday and find somewhere to take the photos then. Cannot wait until it's sunny so I can come home from work, re-do my make-up and go take photos outside again! Totally agree, Hannah! Lovely to see British companies staying true to their roots, especially those originating from the North East!